Each time a shaman dies, a body of knowledge dies with them. In our current world climate it has never been more vital that we bring awareness to the teachings of the Amazonian and Andean cultures into our every day lives. It is our collective responsibility as stewards of the earth to conserve these fast disappearing cultures, their knowledge and wisdom that has only been transmitted orally for thousands of years. Drawing from his twenty years of experience as a music producer, Jackie Bobrowsky started an independent initiative to record and preserve the sacred healing music of the foremost curanderos (shamans) of the Amazon and the Andes. I had the honor to be interviewed by my good friend Cecilia Vicuña, we spoke about my experiences from the Plant Teacher World. Cecilia is an amazing poet, artist, filmmaker and political activist. Out of the heart of the Amazon, we bring you the sounds of three generations of medicine men: paleros, ayahuasqueros, vegetalistas, curanderos. Don Solon Tello, Don Guillermo Ojanama and Jose Campos (aka Don Evangelino Murayay) are *mestizo curanderos and they represent a lineage of traditional healing that spans hundreds of years. Each has his own style of curing and follows the same tradition, the healing tradition, the selfless job of a curandero. They are all related as they have known each other in this and many other lifetimes, they have worked together, learned together, sang together and healed together. They have all drunk together from the same cup, the plant teacher cup, the mariri cup, the vine of the soul cup. Any person of mixed blood. In Spanish America the term denotes a person of combined Indian and European extraction. 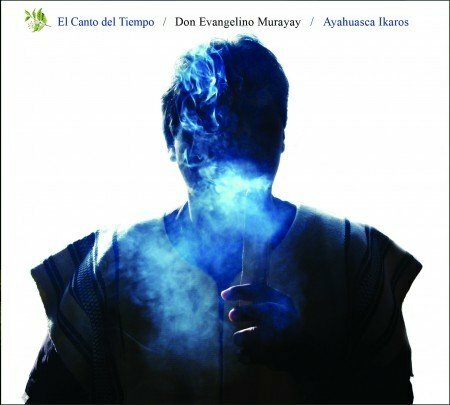 Don Evangelino Murayay has honoured us with a live recording of his beautiful, powerful and healing Ikaros. The music was captured live during a traditional Ayahuasca ceremony. This limited edition CD is packaged with all recycled paper, and includes a fantastic booklet complete with English translations. Born in Cajamarca in the northern Peruvian Andes to a peasant family, the then young Evangelino inherited the vocation to become a curandero (healer) from his grandfather. But as a growing child between family and farm, his interest had not yet been awakened towards the teachings and practices of his healer grandfather and his plants. In his adolescence, he left the Andean highlands to enter into the jungle, the Peruvian Amazon, in search of work and new frontiers. He became passionate about archaeology and participated in expeditions searching for clues to the puzzles of Peru’s many ancient cultures. While in the jungle he met a woman healer, and this curandera tried to make him understand that underneath his passion there was a hidden power. After some time, she initiated him in the way of the San Pedro, opening the doorway to a path of intense exploration of inner worlds and spaces. It was in this road that he met a physician who worked with the Ayahuasca plant and the Dieta. He received this new initiation, which led him to master healers Don Wilfredo Tuamana, Don Aquilino Chujandama, Don Solon Tello and Don Guillermo Ojanama. He spent many years of apprenticeship with these great masters, receiving their wisdom and experience, until he found his own path, his own teacher. For more than twenty years he has traveled this path of effort, search and toil, helping and instructing people from all walks of life in the art of self knowledge through the Dieta and responsible use of the Plants of Wisdom. Don Evangelino’s work has taken him beyond the frontiers of his native Peru, awakening and guiding numerous spiritual beings to consciously locate themselves in the currents of existence here on earth.